Injection moulding is used to create many things such as wire spools, bottle caps, automotive dashboards and so on. Injection moulding is the most common method of part manufacturing. Some advantages of injection moulding are high production rates, repeatable high tolerances, the ability to use a wide range of materials, low labour cost, minimal scrap losses, and little need to finish parts after moulding. In the injection process melted plastic is forced into a mould creating the part. Most polymers can be used for injection moulding, most common it is polyethylene (PE), polypropylene (PP) and Polyvinyl Chloride (PVC). 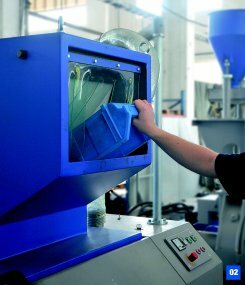 The main challenges in the injection moulding technology are recycling at the machine and central recycling of rejected parts and purges. 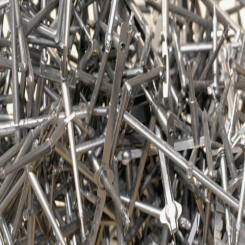 Due to the big range of materials and additives used, recycling directly at the press is the most efficient solution. 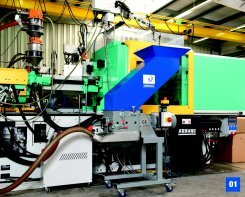 The most common is the recycling of runners, sprues and rejected products directly at the injection machine. Here the GSL slow speed granulators are an ideal solution. The low rotor speed results in a low noise operation and less fines in the regrind. The unique machine design combines a staggered rotor which is directly driven by a geared motor creates a high torque with low power consumption. The ground material is then directly reintroduced into the injection process via a blender or a proportional valve. Another big challenge is the grinding of plastic lumps and head waste accumulated during start-up, colour and material changes. The ZERMA ZBS single shaft shredders have been specifically developed for this scenario. These shredders are used to shred these pieces into smaller particles that can be processed further down in a smaller possibly already existing granulator. The compact GSC and GSE granulators can be used as central granulators to process larger rejected parts. On top of that the Heavy Duty Granulators of the GSH range can be used to process start up lumps as well. The slow speed granulators in the GSL range are mainly used in injection and blow moulding processes as beside the press machines to grind runners and sprues. The machines can be used for rejected products in the inline recycling process as well. Different hopper and base frame designs make it possible to integrate the machine with most types of injection moulding machines and robots. The GSE series of machines are designed as economical granulators for in-house recycling. The aggressive tangential in-feed and advanced cutting geometry of the GSE series allows bulky hollow parts to be ground. The whole GSE granulator line achieves a high quality regrind independent of the material type or form such as injection moulded parts, blow moulded parts, profiles, sheets, film, etc. The GSC series of compact soundproofed machines are mainly used in inline operations or as central granulators for processing of hollow thin walled products, or runners and sprues. The integrated sound proofing makes it possible to easily place the machine in existing operations. With different rotor designs and a wide variety of options the machines can be tailored for many different applications. The wide range of rotors and hopper styles allow the GSH machines to be tailored to almost every application in the plastic recycling field. The GSH heavy duty granulators are mainly used as central granulators for in house recycling applications to process thick walled parts in one step or as a second step granulator after a shredder to reach higher throughput rates. Conventional granulators have substantial problems handling long pipes and profiles. Therefore Zerma developed the GSP range. Thanks to the almost level feeding hopper, long pieces can be fed easily. While the machine is operating there is no risk of blocking, in case of congestion no more material will be accepted by the machine. Once the grinding chamber is empty the machine will accept material again. The granulators in the GRF series are based on the proven GSC series of machines. They are fitted with roller feeding devices specifically designed for the recycling of edge trim from sheet extrusion or skeletal waste in thermoforming applications. The compact soundproofed design allows these machines to be used inline where the regrind can be reintroduced into the production process immediately. The main purpose for the ZERMA PM Pulverizers is the pulverization of PVC regrind in pipe and profile recycling. Working in line with a shredder and granulator to have a balanced and efficient system to handle in house production waste. Another application is the grinding of PE for Roto Moulding applications where the PM Pulverizer is used to create powder required in the production process. The main purpose for the ZERMA ZHM hammer mill is the processing of electronic waste, such as whole computers, white goods and ICBs. The main advantage in these processes lies in its insensitivity to contamination and abrasive materials while being able to achieve a rather small output material. Through the high degree of disintegration it is possible to achieve good separation results in the following processes.